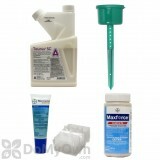 The Outdoor Ant Kit contains the professional products you need to control most common species of ants found outdoors. This kit includes Taurus SC liquid insecticide, a non-repellent spray that should be applied around the foundation of structures and where ants may enter. It also includes two baits with different formulations and food attractants so that you can target any foraging ants: Maxforce Complete Granular Ant Bait mimics protein foods, and Maxforce Quantum Ant Bait mimics sweet or simple carbohydrate foods. These baits can be applied side by side, conveniently, in the included Ants No More Bait Stations. For residents of NY, CA, or CT, see our California / New York Outdoor Ant Control Kit. See all of our Ant Control Kits here. Before applying any insecticides, it is important to inspect and to prepare the treatment area. Practice good sanitation by eliminating food and water sources that may compete with the baits you are about to apply. Outdoor sanitation includes tasks such as keeping outdoor trash cans cleaned and away from the structure, removing debris piles where ants like to harbor, and creating a dry zone adjacent to the structure by pulling back mulch, pine straw, or other barriers. Also find ways to seal up and eliminate access points into the structure. These steps will help not only to treat an existing infestation, but also to prevent future problems. Once you have identified the hot spots where ants are trailing and could possibly enter the structure, you are ready to use the products in your Outdoor Ant Control Kit. *Apply up to 1-2 oz. (2-4 Tbsp.) of Maxforce Complete Granular Bait per station (each side of the station holds approximately 2 oz. of bait). You should not fill the granules all the way to the top of the compartment to prevent excess condensation buildup. *To use the Maxforce Quantum Ant Bait, first remove the blue cap from the tube. For your first application, you will need to cut the tip of the tube with a knife or sharp shears to create an opening. Cut approximately 1/4 in. from the tip to create an opening about 1/8 inch in diameter. Termidor SC was recommended to me by a professional pest control service and I tried it and it was the only product I will ever use from now on. The Termidore SC chemical spray and the Maxforce gel worked (I assume) but the Advance 375A granules put out in the bait traps didn't last one night - the raccoons found them all and ate the tasty contents, destroying some of the traps. I thought perhaps the damn raccoons would henceforth die, so after one week I put down the remainder of the bottle in the remaining traps and, you guessed it, they did it again. So the Advance 375A is just food for raccoons, nothing more. Last year I put down the Advance Carpenter Ant Bait and did not notice any of the traps violated, so I will likely buy that again. Any suggestions? The products that arrived were exactly as advertised. I have completed the treatment and have not seen any ants (or any other bugs) since. It has only been a week or so, but I am hopeful that this kit replaces my 16 year relationship with Clarks. How many months of treatment does the Outdoor Ant Kit include? There is not a set number of months that the kit will last as it will depend on the level of ant activity in your yard, how many colonies there are that need to be eliminated, and how quickly they consume the bait you put down. The Termidor SC concentrate bottle that comes in the kit will make 25 gallons of finished solution, so depending on how big your home is to spray around the foundation will depend on how many months worth of treatment you will receive from it. Can I use the Outdoor Ant Kit in my vegetable garden? I have carpenter ants in my garden. The Outdoor Ant Kit should be applied around the edible garden and the Termidor SC should be applied only up against the structure 10 feet away from the vegetable garden. What should I use to treat for ants outdoors? 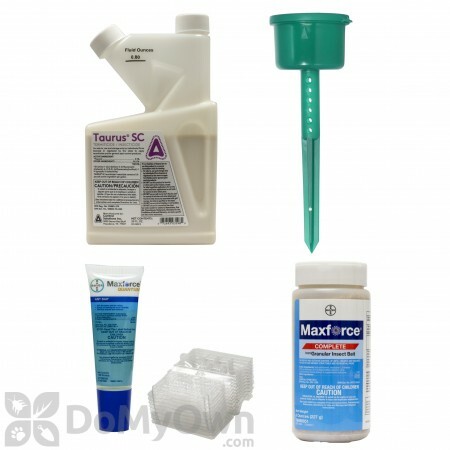 We would recommend our Outdoor Ant Kit for treatment of ants outside. Which ant control product should I use underneath my citrus trees? They are small black ants and our trees are near our house and they keep coming into our house. Best solution would be our Outdoor Ant Kit. The stations would be used with the bait under the trees and the Taurus SC would be used as a perimeter spray around the home, 1 to 2 feet up and out. Can Termidor SC be used in a tow-behind tank sprayer? I need to cover large areas of my yard to kill ants. Since Termidor SC is not labeled to be used in lawns, this application would not be recommended. It could only be used in a tow behind if you are spraying directly around the foundation of the home, 1 to 2 feet up and out. For ants in the yard, the baits in the Outdoor Ant Kit would be your better treatment option.